Humans move heavy loads with heavy machinery all the time in our modern world. That's not likely to change when the grid goes down. Check out the amazing Flip Flop Winch below to keep on cranking when the power goes out for good. You’ve hit a ditch or snow bank and need to get unstuck. Reach into your vehicle emergency kit and fetch your saw or ax. You have an emergency vehicle kit, right? Be sure to add 100 feet of strong rope to the kit if you haven’t already. A tow strap won’t be useful with this winch unless it’s really long. Scout for a straight tree (dead or live – it’s an emergency) to cut. Anything between 4 to 6 inches in diameter is suitable. Cut two lengths in the 8 foot range. De-limb the poles by chopping any branches off with your sharp truck ax. A larger diameter pulley will winch more rope with each revolution. The base of a live tree is perfect. Wrap the rope around the base of the anchor twice and tie it off with a tensioning knot. As the article points out, one of the most useful purposes for this winch is to get your vehicle out of the mud or snow. 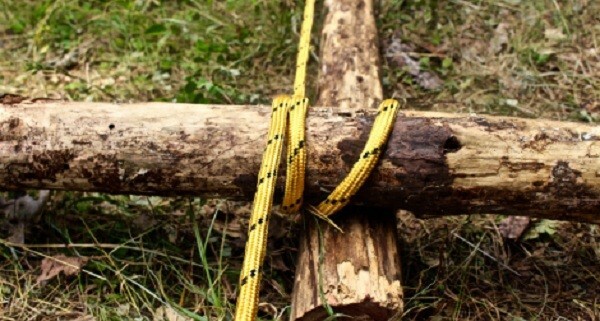 Keeping an adequate road kit with rope and a saw or axe is going to make that task much easier. Apart from that, the uses for this winch are potentially limitless if you have the resourcefulness to tweak your design. With it, you could move entire trees downed by storms or add security modifications to your house when SHTF, it's really all down to your imagination. For more helpful tips on how to make this winch work, check out the original article at Survival Sherpa.